I started with a search on Google for the “best cocktail bars in Toronto” … yes I am THAT original. I was returned with a list of top bars by The Grid, BlogTO, Toronto Life and Yelp. Eventually I decided on the Cocktail Bar located on Dundas St. West. Reviews coined it as a replication of “the New York speakeasy experience” and the kind of place “that makes you linger all night.” Exactly what I was looking for. Now I am not a reviewer, so instead I’ll just share with you the things I would want to know. First off, I felt like I was 21 again, walking in the cold with my impractical footwear and pants that should have been lined with long johns. Anywho, when trying to find the bar I almost walked right passed it. Except for a small sign with “cocktail bar” you would have thought it was an abandoned white brick building. But the slightly rough exterior did not give justice to the warm interior. Upon entering, I felt like I had just walked into a country chic style kitchen. A warm fireplace and white-framed glass cupboards behind the bar made it inviting. Although small in size, the place was definitely buzzing. Luckily we found a free table and nestled in. I would advise you to arrive before 11pm if you want a seat. We were quite close to the other table, but the atmosphere was so intimate and warm that you got lost in your own conversation instead of feeling like you were the third wheel on someone’s date (except when the waitress accidentally handed us the other table’s bill). Minor detail. The highlight wasn’t just the décor. The cocktail list was extensive, creative and delicious ( a little pricey though with drinks about $13 a pop). We selected Sparkling Things and The Lavender Hound (a bar favourite). Both drinks were presented beautifully and tasted even better. 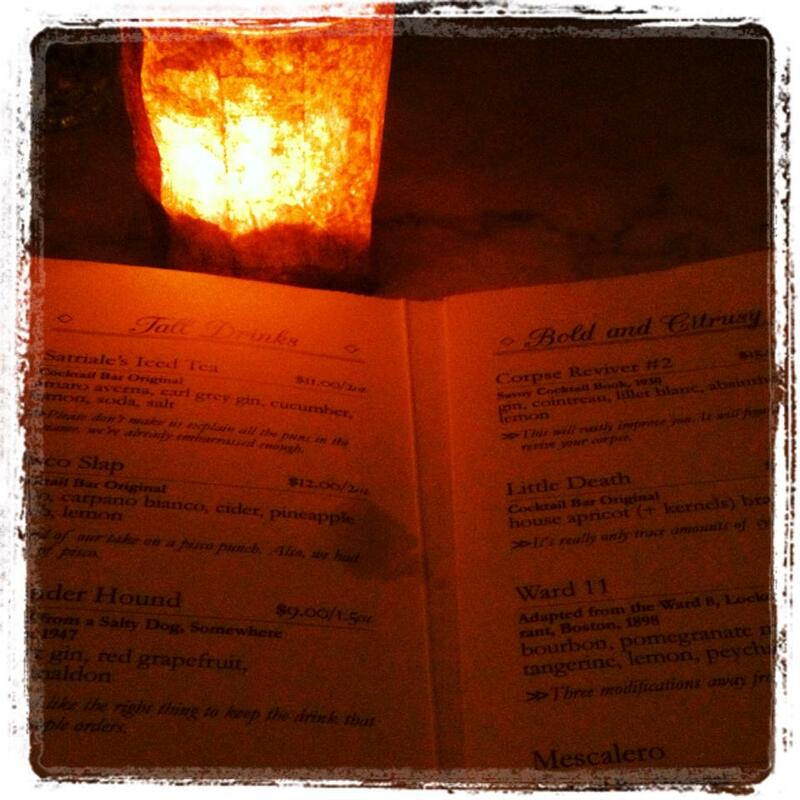 The Lavendar Hound was “herbie” yet delightful and refreshing… I actually had to have a second! This place is awesome for a small girls’ night (any more than four and you will have a tough time finding a place to sit) or a romantic date. I’d say it’s the perfect opportunity to dress a little nicer, put on some fancy shoes, drink a few tasty drinks and chat the night away. 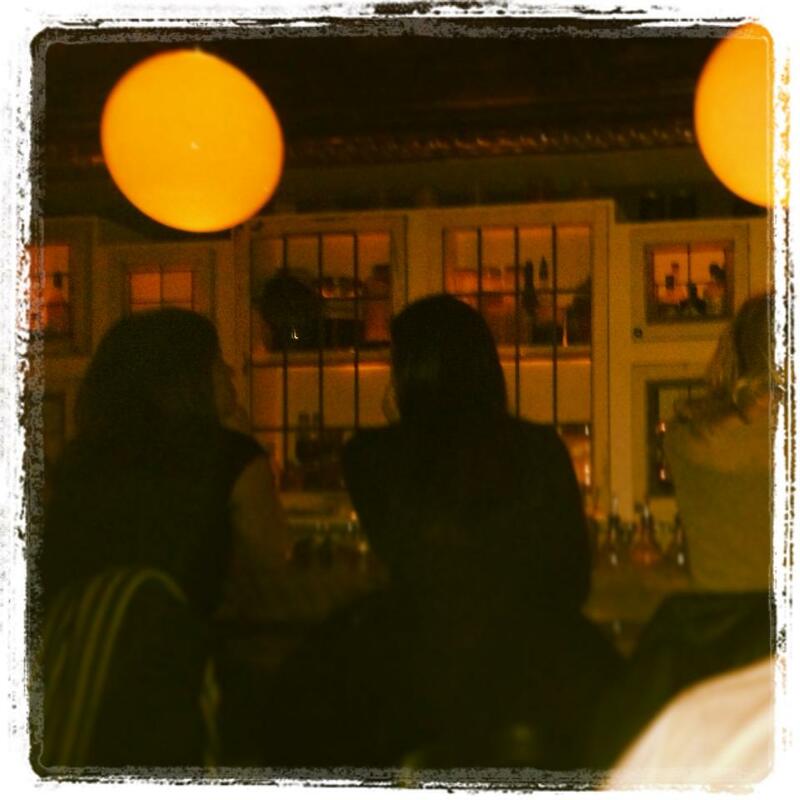 This entry was posted in Restaurants and tagged bars, cocktail bar, girl's night out, Toronto, Torontonowhere by hollypost. Bookmark the permalink.